Poe looks to the future in Poe Dameron #31. 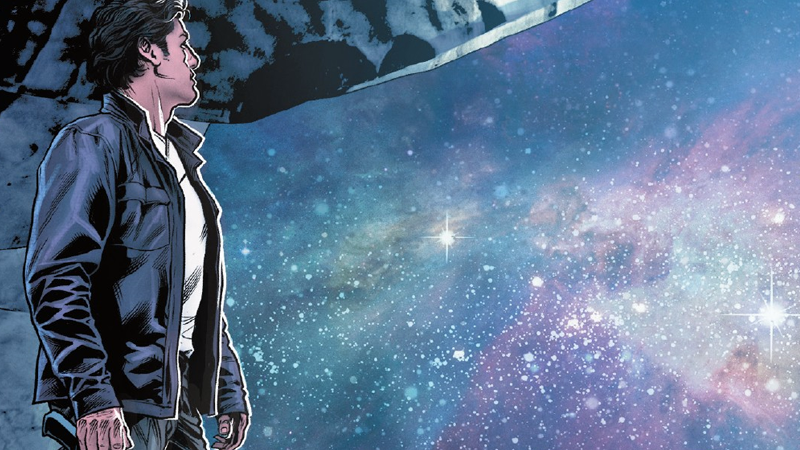 Marvel’s Poe Dameron comic, which wrapped up this Wednesday, has given us important insight into a character who has not exactly had the spotlight in either Star Wars: The Force Awakens or The Last Jedi. Despite that, Poe’s comics have had to jostle in tone just as the character himself has been jostled by the events of the films—leading to a bittersweet conclusion. The last few issues of the series, concluding with this week’s Poe Dameron #31—by Charles Soule, Angel Unzueta, Arif Prianto, and Joe Caramagna—have been set in and around the immediate conclusion of The Last Jedi, with General Organa, Rey, Finn, Poe, and what they believe is pretty much all that’s left of the Resistance piling into the Millennium Falcon and fleeing Crait. It’s an arc that is intriguing from an almost fandom-academia point of view—technically, after all, it is the most current Star Wars material available, from where it sits in the timeline of a galaxy far, far away. But it’s also been fascinating because it gives us a Poe who is, for all intents and purposes, very much not the happy-go-lucky, rules-defying charmer/ace pilot he was in The Force Awakens, or for most of this comic run. This is instead the Poe forged by the crucible that was the events of The Last Jedi—a Poe who’s just seen friends and fellow soldiers, fellow heroes, slaughtered, and seen the Resistance he fights for so dearly laid so low. It’s the Poe who had to learn that his braggadocio can’t solve every problem the galaxy throws at him—the one who had to swallow a bitter pill when realizing the romanticism of being a hero isn’t all that it’s cracked up to be in a fight for survival. It is, to put it in easily, conveniently giffable form: the post-slap Poe Dameron. It’s fascinating to see how Soule has handled Poe’s surprising arc in The Last Jedi in these last few issues of the Poe Dameron comic, but it really comes to the fore in this last issue in particular, after Poe has learned that his fellow Black Squadron pilots—Snap Wexley, who we know is in Episode IX, Karé Kun, Jess Pava, and journalist-turned-Resistance recruit Suralinda Javos—are still alive. Albeit barely, after a mission to find Resistance allies Leia gave them before they fled D’Qar is going south, as the First Order descends on the planet Ikkruk. Poe and Leia weigh the lives of Black Squadron against the Resistance... what’s left of it. Their situation is bad, and the minute Poe learns that, he wants to do the same thing that he always does: get in a fighter and dash off to save them. However, as he argues with Leia that rescuing Black Squadron is something the tattered remnants of the Resistance should be doing right now, it becomes clearer that this isn’t just the reasoning of a hotshot pilot—it’s Poe being the leader Leia wanted him to be in the first place in the film. Because, as Poe reasons, the point is not to save four people—at the potential cost of what’s left of the Resistance. The point is that publicly showing the galaxy that it’s willing to do so, despite the threat, will get their message across, and show that they’re still out there, sowing the seeds of rebellion that they so desperately need to do right now. Yes, it involved a bit of dashing heroics that Poe loves so much—thanks to a sneakily-acquired fighter from Grakkus the Hutt, the seedy gangster the team met early on in the comics—but it’s a risk Poe pays off as a leader. He’s rewarded not just with a reunion with Black Squadron (and to get to tell a First Order Commander that their Supreme Leader is dead, and the Resistance is still standing, before blowing them up), but the support of Ikkrukk in the coming fight against the First Order. Poe reflects on the lesson taught to him by Leia, and Admiral Holdo. Sweeping, grand heroics or Jedi showing up won’t be what really saves the galaxy as the First Order makes its play. It’s the small things—choosing to defend your friends over sticking it to the bad guys, choosing to fight another day over going out in a futile blaze of glory. The battle between good and evil isn’t just fought by heroes and villains, but ordinary people—and holding onto the smaller picture is what will bring about lasting change, rather than hoping a hero will come along and burn themselves up to save the day. It is, as Rose put it in the movie, not about fighting what we hate, but saving what we love. Black Squadron re-unites for one last time in Poe Dameron #31. It’s a hopeful message to go out on, but one that feels intrinsically different for the man who thought he’d solve all his problems by getting in an X-Wing and blowing something up. Time will tell if this is the sort of Poe we’ll meet in Episode IX next year, but I hope it is. It’s an important step in his evolution beyond just being the cocky ace pilot. Given how Poe Dameron’s tone has evolved and changed over its run in reaction to The Force Awakens and The Last Jedi, and despite the hopeful note it goes out with, I can’t help but feel sad that it’s ending now, and not in the wake of Episode IX, so we could see whatever comes of Commander (yes, once again, thanks to a re-conciliatory promotion from Leia early in the issue) Dameron and his friends over the course of this entire saga. 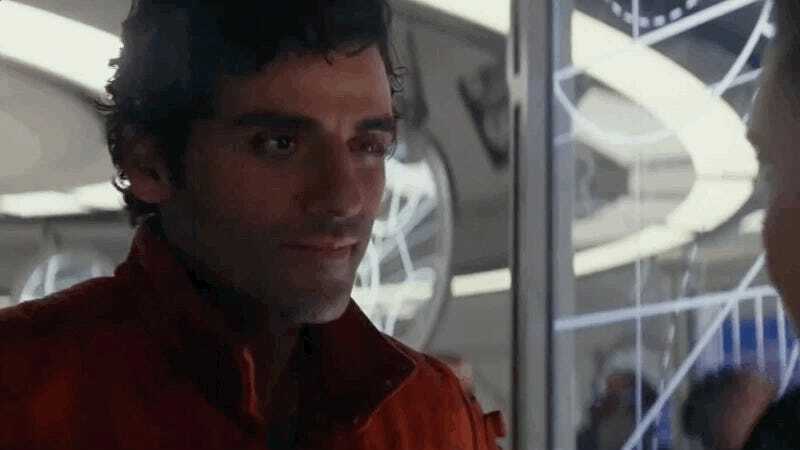 It’s a testament to its quality that the series got to dive into a moment in Star Wars that Lucasfilm is still hesitant to really cover outside of the events of the sequel movies, especially through the focal lens of a character as prominent as Poe. As long as there’s still light, we’ve got a chance. But the fact that it got to do so, so close to the events of the films, is itself a bit of a double-edged sword. It means that, for now, there was no real way Poe Dameron could really continue exploring these characters until we can see whatever J.J. Abrams has in store for Poe and Black Squadron in Episode IX. For all Lucasfilm makes of its rebooted expanded universe meaning “everything matters,” the movies will forever be the primary source of information and growth for these characters. But Poe Dameron got to push what it could do with the character more than most tie-in material would be expected to, and in turn, it gave us a Poe who’s growing just as fascinatingly as he is on screen. Despite the sadness of its end now, I’m glad Poe Dameron got to do what it did. I can only hope the series will fly again in the future, when the movies have caught back up to what Charles Soule and his team were doing with Poe.